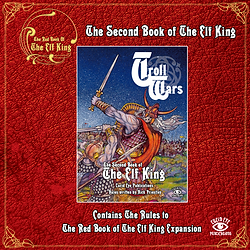 Writer of the cult hit The Red Book of The Elf King, Rick Priestley presents the first expansion to the game since its release! The Second Book of The Elf King explores the Outer Isles, with a whole new Campaign, leading to a Hellish conclusion. Players will rewrite the History of Eas in their wake. The game features a total of six new Circles being introduced into the game, alongside Scenario characters. and a vast new array of spell lists and rules adding on to the base game.